i hope you all had a wonderful thanksgiving! and if you're not out doing the crazy shopping thing, maybe you feel like crafting today! today's project is my take on martha stewart's ribbon card holder (photo 1 of 5). i made mine a little more rustic, making it out of burlap instead. and after the holiday season i plan to use it as a photo holder, because in my opinion you can always use more photo holders! 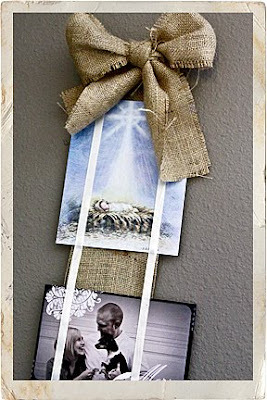 -use some of last year's holiday cards, some card envelopes or some photos as templates to space out the narrow ribbon on top of your burlap. make sure to put some going horizontally and some going vertically. then apply a small amount of fabric glue between your "templates". -when all of your narrow ribbon is glued down, tie your bow for the top. then attach it with some fabric glue as well. 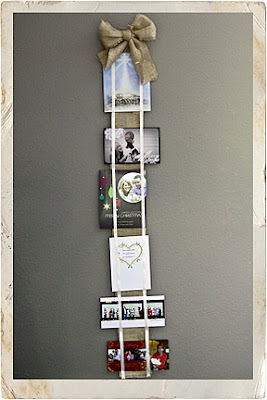 -hang your card holder on the wall with a small nail or tack and fill with holiday cards and photos. ta-da!